You are here: Home » Focus » Holi Hai! The Color of Happiness and Peace! Holi Hai! The Color of Happiness and Peace! On this auspicious occasion of the festival of colors I pray that we are all blessed with all the colors of Inner Celebration that can last beyond this festive day of Holi. May we see and feel that it is our mind by which we project our own colors on the canvas of life and with the brushes of our efforts paint our life. It is always up to us how we paint it!! Let us choose vibrant colors of Joy and sooth our moments with a loving, quiet brush strokes of silence, peace and blessedness!! Holi brings to us the message of spring and the celebration of new life in Nature. The essence of life is ever new, ever fresh, and ever blissful. Nature offers us hundreds of options, just as She manifests in trillions of forms and colors, showing Her infinite creativity. Like Nature, let us paint our life with the brush of colors that are genuine and life positive. As we seek to paint a positive life, we come to realize that the mind has no color of its own. But it gets tinted with any color it identifies with, be it pain or pleasure. Meditation gives the mind the power to break away from its self-created pains and suffering, and lift us to the world of unconditional love and peace. We all are the painters, artists of our own life. We keep painting with the brush of our mind and heart on canvas of our life the picture that we see of ourselves as the time unfolds. We are the creators and shapers of our own destiny, the past creating the present and the present creating the future. Through self-awareness, the continual process of our inner culture, we find life’s flow, and flow with it. When we are aware, our steps are like a dancer; our strokes on a canvas of life are like a painter’s. We become the co-creator of our own happiness and peace. Happiness has its own color, the color of gratitude and love, appreciation and celebration. 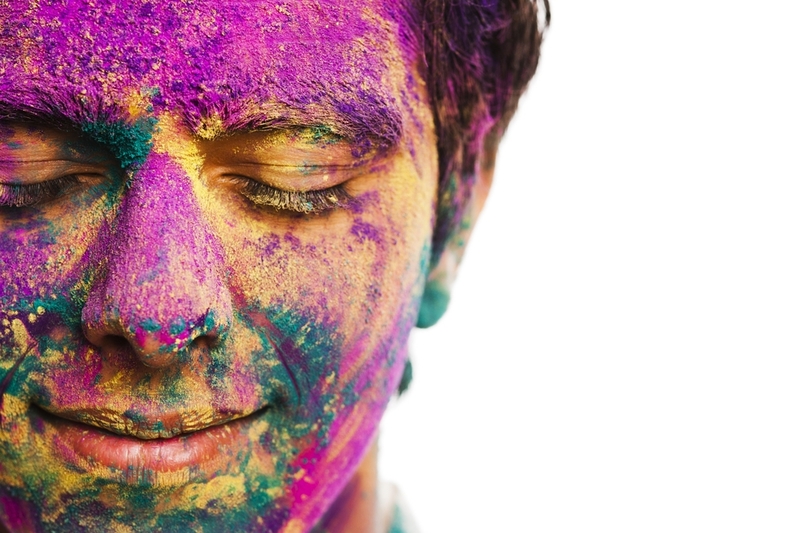 When we are happy, any day of the year becomes the day of Holi. When our body is relaxed and our breath peaceful, our heart then dances with the birds in the sky, and smiles with stars in the galaxies. We then throw the color of joy and positive appreciation on everyone we see or meet and are truly in the spirit of Holi hai! We don’t expect anyone to make us happy. Instead we are privileged to spread happiness first and smear everyone with the color of our condition-less love and blissful spirit. May Holi, the festival of colors, not only color our physical transient body for a day’s delight and excitement, but color our mind and heart with the color of love and peace, surrender and devotion, forgiveness and harmony! Let each of us strive to first live peace, live Love, live harmony. Then and then alone our next progeny will survive in this vibrant planet Mother Earth! This holi, show your ‘TRUE’ Colour !